This beautiful teapot and matching cream and sugar is from Georgian England. It is mainly of gold color with an eggshell white leaf design throughout. 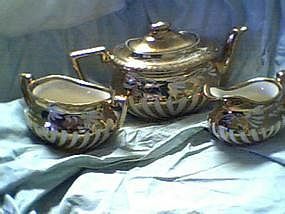 It is in excellent condition, other than the teapot lid which has a small crack. This is a wonderful set. This Royal Albert saucer is 5" in diameter. 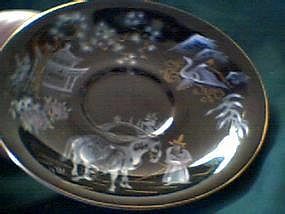 It is titled Oriental and is black in color with oriental pictures and gold trim. This plate is in excellent condition.